Secret loans to political parties would be banned under new laws being planned by the lord chancellor. Lord Falconer told peers he was suggesting that a ban be included in a bill already going through Parliament. Labour has denied allegations of sleaze after several businessmen who secretly lent the party millions of pounds were then recommended for peerages. Ministers say Labour is publishing the names of its past lenders, and they hope other parties will do the same. The government is asking other parties whether the new laws should force details to be published of previous loans. One Labour lender nominated for a peerage has now claimed he was advised to keep a £250,000 loan secret. Newspapers have reported that food company tycoon Sir Gulam Noon has been blocked from joining the House of Lords because the loan was not disclosed. Sir Gulam told the Times newspaper a "senior party man" had told him "there was no reason why I should declare this loan because it was refundable" and that it would not be covered by donation laws. The loans emerged after a watchdog raised concerns about the nominations for peerages of three other businessmen who gave unpublicised loans of millions of pounds to Labour. Following revelations that Labour's elected treasurer had not known about the loans, the party revealed it had received nearly £14m in undisclosed loans from wealthy backers to fight last year's general election. Lord Falconer plans to use the Electoral Administration Bill, which is back in the House of Lords on Tuesday, to ensure all future loans have to be declared. 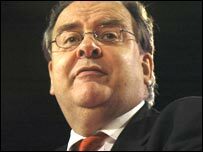 Lord Falconer dismissed suggestions that the furore would hasten Tony Blair's departure from Downing Street, and said other parties had used similar loans. "The problem is not a group of people in No 10 Downing Street," he said. "The problem is about how we fund political parties." But Lord Strathclyde, the Tory leader in the Lords, said government plans to close the loophole in the funding rules now were like a burglar caught with a "bag of swag who says he only wanted to polish the silver". The House of Lords had "been gravely damaged by what inevitably be known as the loans for peerages affair," he said. The Conservative Party, which was lent £9m in 2004, has yet to publish figures for 2005. Tory leader David Cameron is also proposing more state funding for parties. He says parties with MPs should receive 60p in taxpayers' money for every vote they win at general elections. He also wants to introduce tax relief on donations up to £3,000. Liberal Democrat leader Sir Menzies Campbell said the new laws on loans should be retrospective, so details of past lenders could be revealed. He also said there was also a case for "limited" state funding. But the UK Independence Party said a donations limit and state funding would hit smaller parties disproportionately without tackling the problem of transparency.